It all started when this Australian man gave me free dessert. Josh and I arrived at The Cookery two winters ago just after Christmas to find the doors locked. As we were walking away, an Aussie named Brett beckoned us back and made sure we didn’t go away empty handed. (The cake was AMAZING, by the way). This little God moment turned into a huge blessing for me as I have since been entrusted with telling The Cookery’s story twice, first for Edible Nashville Magazine, and now in the video below. It has been an honor sharing the stories and communicating the vision of the remarkable eatery and ministry that is The Cookery. This unassuming cafe nestled on 12 South in the Edgehill neighborhood of Nashville is so much more than it seems. Inside formerly homeless men are getting a second chance at life. They live in community that is safe, their needs are met, and they go to work each day to learn the culinary arts, a trade that will enable them to once again become self-sufficient. It is a place of miracles. Watch and see. I made it to 30, in more ways than one. Over the last several weeks I’ve been on a quest to make 30 things more or less from scratch with March 4, my 30th birthday, as the deadline. I have linked to the remaining items below. See my first and second and third and fourth updates. A year and a half ago I wrote a 2 part series called Getting Gritty. This is the third installment on this theme. Part 1 defines grit and examines the life of Leonardo DaVinci and his remarkable perseverance, and Part 2 discusses the balance of grit and rest as the formula for prolific creative activity. What do Leonardo DaVinci, Julia Child, and Bob Dylan all have in common? Our first answer to this might be “genius,” meaning natural talent, or “success,” meaning they were in the right place at the right time. The temptation for those of us struggling to live creative and productive lives is to think that they had something we don’t have—or worse, can’t have. If you are like me and fall prey to this temptation, I have some good news and some bad news. The good news is that what these great minds have in common is something we too can have: grit. The bad news is that what we need to be like these great minds is grit. Five to ten years, no achievement. That is a tough pill to swallow, especially for our instant gratification generation, a people trained to believe hard work is the stuff of fast movie montages and is over before we can blink. Is this really what it takes? Um, well, yes. Sorry to break it to you. Grit is the thing that links great minds, and if we seek to accomplish creative feats then we must keep working, disregarding failures and the lack of an audience. We must keep creating. Todd Henry, author of the Accidental Creative, urges his readers and podcast listeners often to undertake “unnecessary creating,” meaning creative activity that we do for ourselves, for fun, and not for money. Pursuing our passions is the best training for prolific creative accomplishment; passion and grit go hand in hand. And that is the good news. When we think of bearing down and getting gritty, we might think that this means assuming supernatural self-discipline. While discipline is important, willpower only goes so far. The only thing powerful enough to push us to this level of creative pursuit is passion, love of the craft, love of beauty, and a surviving hope that, no matter how long it takes, someone else will share that love with you. In this video essay we learn about the profound passion of Vincent Van Gogh, and while I believe he went overboard by sacrificing his health to his art, his grittiness inspires me to push past a temporary lack of the spoils of “success” and just keep creating. Very pleased to share with you a new documentary directed and produced by a friend of mine, Grant Howard. Forged is the fascinating story of an aging coppersmith and his son who are brought together by the father’s final sculpture. The film impressed me particularly with its beautiful photography, the original score reminiscent of Wagner, and its reflections on the value of art, beauty, and family. Major kudos to Grant! Congratulations! How would you like to film people baking bread, making art, and playing with adorable children? You know, this freelance thing might be hard, but sometimes a super fun project falls right in your lap, and you find yourself suppressing your giggles because you are shaking the camera. 1) Storyboards give confidence. Normally for my video projects, I create an outline with the shots I want to get, but I also leave a good bit open to day-of serendipity. This time around I did complete storyboards. Once these were approved by the client, I not only had a complete list of shots I needed to collect, but I also had more confidence that I was on the right track in terms of the client’s vision for the project. The storyboards created a mid-point check in so that both the client and I could feel comfortable about the filming plan. 2) Storyboards give context to the “Talent.” I brought the storyboards to the shoot and, boy, was I glad I did. Not only did we have six young kids who all wanted to know what was going on, but one of the mothers had limited English, so communication could have been very difficult. The pictures proved invaluable in explaining to this mother what I was going to be doing in her house. It also got the kids really excited to see the story they were about to act out. 3) Storyboards keep you on track. So, Kids move. A lot. It’s distracting. Another reason I was happy I did the storyboards was because there were six kids running around a tiny kitchen during the shoot. I could only catch so much in the moment, and I had a linear story to tell. Having the complete storyboards with me helped me film nonlinearly while making sure I didn’t forget anything. It’s funny how much I remember. I haven’t had any affiliation with the place in probably fifteen years. I assume the property will go on to a new purpose, and perhaps even serve again as a place of worship for new people. I pray this is the case. Even so, as many memories as those walls held for so many families, I can’t help but feel like maybe there is something good to gather from this. It’s just a building. We need to keep that perspective. It is an earthly thing. This is not to say that God does not consecrate spaces or bless material things; He cares about the physical. But He cares a lot–oh so much more–for us. He wants a relationship with us. He wants us to pursue Truth (yes, that is a capital T). He does not want us to go through the motions. He wants a church of vibrant, faith-filled people, and this body, this church, can meet anywhere, whether it is in a hut, or a cathedral, or on a dusty road where Christ once said, “The son of man has nowhere to lay his head,” then bid us to follow him. In honor of these sentiments, I want to share with you again a project I did with a musician friend a few months back. It is a song called, “We Are Dead,” performed live in an abandoned church. Peter McKeown of Woodferd astounds listeners with his musical prowess and thoughtful poetry. This song touches on the juxtaposition of the temporal and eternal, and so when Peter came to me saying he wanted to do a video in an empty church, it couldn’t have been more appropriate. In some ways, the lyrics and the song are a little shocking, but I hope you hear, as I do, the underlying hope: some things do last forever. We just have to make sure we know what those are. And now presenting….drumroll…..my latest video work! Kate Whitley of Little Things Studio is an artist here in Nashville. Her delightful and wildly popular work flies off the tables at art fairs as well as off the virtual Esty shelves. It was a pleasure just to hear about her latest project and an even greater joy to help her with this video to fund it. Kate put the video up on the new Etsy fundraiser page and she is already 158% funded! Even so, be sure to check out the project and order an advance copy of her new, beautiful 30 Days of Hymns reusable desk calendar. As often happens when we work on projects that excite us, we sometimes forget why other people might not be as excited. My first job as storyteller then was to get at WHY Kate’s audience should be excited. After all, Kate is not stating facts; she is making an argument and an invitation. They are not going to buy it because it’s a great deal or even because it is pretty. They are going to buy it because they will believe, along with Kate, that hymns are special and the poetry impacts us deeply. Therefore, the video needed to communicate this in what Kate said, in how she said it, and through the visual media. This WHY factor provided the framework as I wrote the script, planned shots, and directed Kate’s delivery. I once went to a workshop put on by Stillmotion studios. One of the critical elements in their filming process is finding five keywords that guide practically every decision from lighting to interview question choices to soundtrack. This is a great discipline which I admittedly and regrettably COMPLETELY forgot to do this time around. Even so, I asked Kate enough questions up front that I felt confident we were on the same page. If I had to choose words retrospectively, they might be whimsey, light, heritage, sharing, and revival. Please note that these words could have been completely different, like mission, preservation, duty, beauty, and ancient; these words would have yielded a more solemn atmosphere in which Kate would be on a quest, rallying troops, etc. In the video we made, by contrast, Kate invited viewers into a community of lighthearted people who see the past, present, and future value of these meaningful words. In addition to this atmospheric distinction, I also made sure Kate and I agreed on some reference material. Kate’s enthusiasm immediately made me think of Kid President, with its peppy music, warm lighting, quick cuts, and whimsical illustrated text, so that is what I copied. 3) Lighting takes practice. Sigh. I’ve been on a quest for all the DIY lighting info I can find. I am pleased overall with how the final project looked in terms of color and exposure, but I lack some consistency. At one point I turned on another lamp in the middle of filming like a fool. It changed everything. Ah well. You live and you learn. Even so, if you know of any good resources on inexpensive lighting equipment or techniques, I’m on the hunt! How can you show character arcs in characters who, of necessity, must consistently embody specific emotions? How closely will this story reflect real biological mechanisms? Will the story even be interesting? You see, I love story. A well-told story both warms my heart and stimulates my mind. While Pixar has proven itself a master of story in the past (Monster’s Inc., The Incredibles, Ratatouille, etc. ), more recent films impressed us less. Brave, for instance, was a catastrophe in storytelling. What the heck were those little fairy things and why does Merida keep following them? Why is this girl so determined to poison her own mother? What are the rules of this fate-changing business? All this to say, I was dubious of Inside Out’s potential, especially considering the daunting subject matter. The short of it: Definitely go see this movie. As a creative exercise, Pete Doctor’s trip into this little girl’s mind cannot fail but to impress. Coming out of the theater I dearly wanted to turn around and see it again to appreciate more fully the amount of research that went into the film. I wish I knew more about psychology and neuroscience because I wager this film is jammed with references to current theories on brain function and behavioral science. 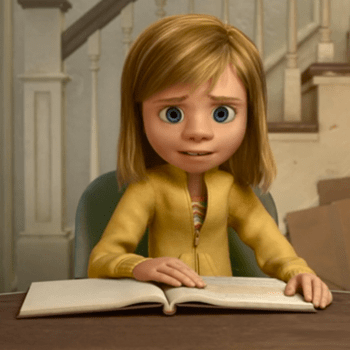 As a story, Inside Out is perhaps not as rich or satisfyingly complex as many of its predecessors, but it still kept me engaged and made me tear up at the end (in a good way!). The long of it: Josh and I had several thoughts coming out of this movie. I would love to hear yours as well so please chime in below in the comments. As I have learned in my study of storytelling, stories are stories because of conflict. If there is no conflict, there is no story. Most often, and especially in animated films, conflict comes from an external force, usually in the form of a villain. Inside Out bypasses this convention and instead risks leaving conflict merely to challenging circumstances. Circumstance A has Riley, the 11-year old, and her parents moving from Minnesota to San Francisco, an upheaval that challenges Riley’s emotional status quo. Circumstance B involves two of Riley’s anthropomorphized emotions, Joy and Sadness, getting lost in Riley’s mind and trying to get back to “headquarters” to reestablish Riley’s emotional balance. So, no bad guy. Do we miss the bad guy? Not really, which is in itself impressive. I did feel, however, that I never really feared for the main characters, which indicates the conflict could have been weightier. Consider, for instance, the furnace scene in Toy Story 3. I actually feared the toys would burn up the first time I saw that scene. I’d guess most people did. THAT is powerful conflict. Alas, Inside Out lacked that level of oomph. Like I said, Inside Out as a creative exercise absolutely enchanted me. Whereas I fawn over films like Monster’s Inc. for creating consistent rules in a completely made-up world, I now salute Pixar for creating a colorful and imaginative world and staying, as much as they could, within the painfully constricting boundaries of real life behavioral and emotional science. In other words, the ways of Riley’s mind necessarily had to abide by reality in order for her story to have any power. Pixar likely had to question themselves every step of the way, asking, “Does this analogy work?” or “Do our brains actually do that?” This could not have been easy, but given the magnitude of the challenge, they did a fabulous job. 3. Where does Reason live? Ok, so, fair warning, my philosophy major is coming out now. Inside Out is about emotions, but we know that our emotions alone do not govern our decisions. We deduce, we calculate, and we employ inductive reasoning in our ongoing quest to make something of this world. This begs the question, therefore, where or what is Reason in Inside Out? Is Reason an absent character? Does Reason live elsewhere, outside of “headquarters”? Or perhaps Reason is not its own being, but rather the product of the emotions working together to intuit Riley’s best choices? This last option is my best guess for how Pixar chose to tell this story. While it works to do this, and while the story was impressively simple and consistent, I for one really wanted the question of Reason to be addressed. It just wasn’t clear, and if I noticed it, others probably did too. Reason could have been another character to challenge the emotions’ convictions. Reason could have been the villain! Or even if Reason were not another character, the emotions could have engaged in more elaborate reasoning and thereby reinforce the message that no feeling or memory is ever one-dimensional. 4. I wanted more from Sadness. The character of Sadness is, well, a pushover. 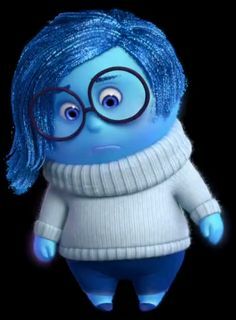 Because I don’t want to give away the ending, I will just say that I wish Sadness displayed a little more hutzpah and foreshadowed her value earlier in the film. Had she been written stronger from the beginning, she would have been a better counterpart for Joy, who is so Type A she comes off as a little obnoxious, however well-meaning. Had Sadness been stronger, their conversations would have been much more intriguing and their conflict much more subtle and complex. It makes me happy that all three predominant characters in this film are female, given the long, male-dominated lineup of Pixar films. There were a few give-away expository lines that dropped like anvils. “These are the core memories. They make up Riley’s personality.” Um, Ok. I know you were up against a lot with this story, but surely there are ways of showing and not telling…? I am very impressed with Pixar’s portrayal of Riley; I felt like she was a real person. Why did Riley have both male and female emotions while her mother’s were all female and her father’s male? Also, why is the mother’s emotional leader Sadness and the father’s leader Anger? Does this mean anything? Are we supposed to conclude something from this? I’m not sure how I feel about the “Abstract Thought” scene. I wish Fear, Anger, and Disgust were more developed and nuanced, especially as they try to maintain control and “do what Joy would do.” When they try, they utterly fail, and I think we were supposed to find this funny. I, however, wanted to see more deliberation. When we feel angry, for instance, the feeling can vary from indignant to frustrated to confused. I know I’m asking for a lot, but it would have been nice to see more contemplative treatment of these nuances. Is it at all possible to retrieve things from the giant pit of lost memories? Why can the emotions remember things that have gone into the pit when Riley cannot? Again, I would love to hear your reflections on the film. Please share!